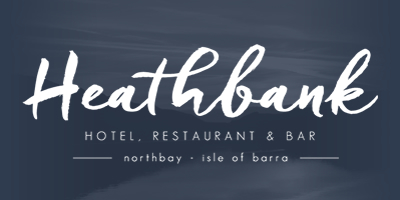 A warm welcome to Heathbank – a unique, but modern small hotel on the Isle of Barra. The family run hotel is managed by ‘locals’ who have good knowledge and understanding of island life. 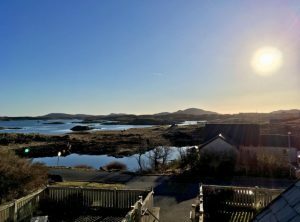 Supported by a super, friendly team of staff, the hotel is situated in Northbay, a tranquil area, but ideally placed with the famous beach airport and the Sound of Barra ferry just 2.5 miles away. We are only based 6 miles from Castlebay ferry terminal. The hotel has six comfortable en-suite bedrooms (one is our new Log Pod), a bright welcoming bar and restaurant, a reception area and a small dining room where breakfast is served. We have a lovely outdoor garden with tables to enjoy the sunshine (yes it does visit Barra) and natural scenery. Locals often frequent the restaurant and bar, often willing to help or advise or simply tell you a few local stories or two! Our bar closes at 11pm each evening to ensure our guests have a peaceful sleep! 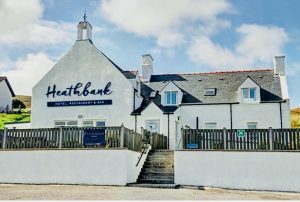 Heathbank Hotel is a perfect base from which to explore the island’s beauty, be it the Machair blanketed with primroses, varied wildlife, boat trips, kayaking, snorkling, walking, cycling or just meandering along one of the unspoiled beaches. Bliss. At the end of each day visit our warm and friendly bar, which stocks a wide range of malt whisky, a refreshing selection of gins, wine, prosecco and chilled ales. Coffee and tea are available daily from 11am, and we serve home-baking and soup throughout the day. Our evening menu runs from 5.30pm until 8pm. We source our produce as locally as possible such as our shellfish, fish and lamb. All our desserts are homemade and delicious! Local plea! As a small community, we ask kindly that everyone adheres to the ‘passing place’ rule. We all understand people like to drive slowly and safely, whilst looking at our beautiful island. Our community relies on volunteers to support our emergency services. All in unmarked vehicles. Volunteers for RNLI, Coastguard, Fire-fighters and Medical staff may be on route to attend an emergency. Please, use the passing places to allow people by. This will be truly appreciated by our community.